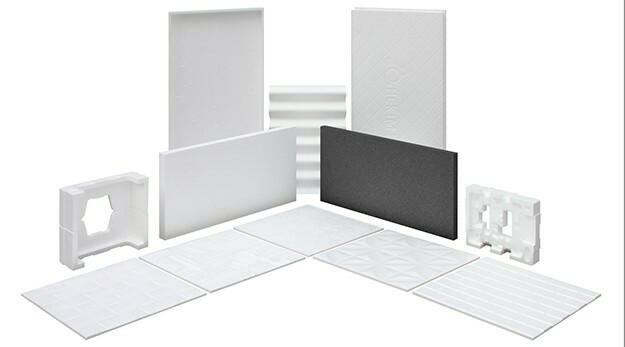 Expanded Polystren Foam (EPS) | Piraziz Int. Serv. Sol. Expanded Polystyrene (EPS) is a foamy, thermoplastic, closed pored and typically white colored heating insulation material obtained from petrol by expanding polystryene with pentane gas. Small pores formed due to pentane and the gas inside, exchange places with air a short while after the production. So that air caught inside millions of tiny closed pores performs heat insulation. It contains static and dry air at the rate of 98% . EPS can be produced in various densities, its technical specifications can be altered in required ranges, it offers the same heat insulation performance as other materials in the most affordable way, its features does not worsen in time and it is an insulating material with consumer and eco-friendly features. EPS can be produced in various modules with injection technology. Water vapor and pentane gas is used in the production process. Gases that harm ozone layer such as CFC and its derivatives are not used in production of EPS. Heat insulation resolution is constant in EPS. B1 class (flame-retardant) raw material is used. EPS does have flexible structure due to its production technology. EPS is an everlasting material. EPS does not contain poisonous or harmful substance. Resistant to acids and alkalis. Light weight, easy to install and stacked. It allows comfortable places by means of helping the structure breathe and provide a healthy environment. It provides profitability in optimum level when used in accurate details and densities by virtue of its superior features. It is compatible with construction materials used in the building it is applied on. This product’s length of life is equivalent to other buildings’ when applied in accurate density according to building physics and construction rules. It is also used as sanitary package in food sector and shock absorber preserver in white goods sector. EPS begins insulating from the moment it is applied on the buildings.